I don’t know how it happened, but it must have been interesting when the first human being saw his (or her) reflection in the water. Later in history, humanity learned to polish certain surfaces, and the mirror as we know it, was born. These interesting reflective contraptions have the uncanny ability to show us the way we really are (particularly in the morning). While we may not love what we see in the mirror, most of us would never leave home without first checking our appearance to make sure everything was in order. Personal accountability is crucial for every effective Christian leader. Paul writes to Timothy, “Watch your life and doctrine closely” (1 Tim. 4:16). Paul also instructed the Corinthians to “Test yourselves to see if you are in the faith; examine yourselves" (II Cor. 13:5). Be Honest. We all want to think the best of ourselves, but we can also be our own worst critics. It is important to make sure we are examining our lives in genuine honesty, not making excuses for our failures, but also recognizing the redemptive grace of God at work in our lives. Be Consistent. Hold yourself accountable to a consistent devotional life. Practice the spiritual disciplines of prayer, worship, study of the Bible, and others, in a regular, consistent fashion. Be Faithful. Walk in the light God has given you. Don’t get bogged down spiritually by neglecting to notice and deal with those areas where you may not be fully faithful to what you know God has already said. Since our relationship with God is ultimately a matter of the heart, we must be accountable to ourselves. We must take inventory of our own hearts before God if we want to continue to progress as a Christian and as a leader. 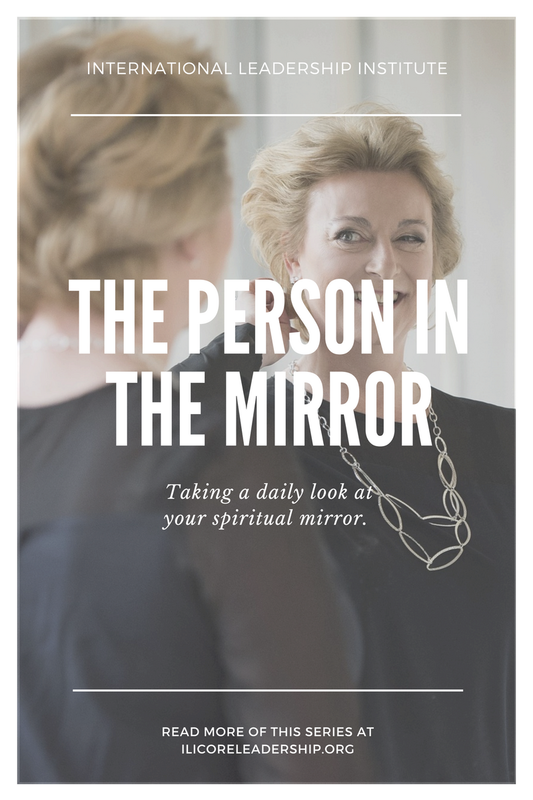 This is done by looking at the Spiritual mirror of our conscience, illuminated by the Spirit of God, and making the necessary corrections so our lives are pleasing to God and a testimony to our neighbor. NOTE: This is the third of five posts on the subject of Accountability. Make sure to check out the others. Are you a part of a small group? Here are seven benefits of being a part of a small group. Remember the LONE RANGER, saving the day and riding off into the sunset? Find out why this is nice for television, but NOT for becoming a God-inspired, visionary leader. While we may not love what we see in the mirror, most of us would never leave home without first checking our appearance to make sure everything was in order. Paul also instructed the Corinthians to “Test yourselves to see if you are in the faith; examine yourselves" (II Cor. 13:5). Relax! I know we often consider that day when history, as we know it, will come to an end and every human being that ever lived will stand before the throne of God, but this is not a post about that. The Bible says we will escape final judgment because of what Christ did for us, but His sacrifice does not exempt us from giving an account to God of how we lived out the faith which saved us. Every leader is just one step away from meltdown, but with integrity, accountability, and focus, we can glorify God in our leadership. Are you protected against leadership meltdown?